Even by my own already low standards, this one may have set a new "low" - 14mi and 3,500ft of gain to climb a peak that doesn't reach 1,000ft and has less than 300ft of prominence. And I spent 45min driving to the TH each way, to boot. Peak 980ft and the bonus Riley Ridge are located on East Bay Municipal Utility Dept (EBMUD) property on the east side of the San Leandro Reservoir in Alameda County. My $10 yearly trail permit had run out back in May so I was up at 5a trying to renew it online to no success. I kept getting a "Page not Found" after submitting the form three times, so I tucked the old permit in my pocket and headed out. At least I tried. When I got to the Chabot Staging Area at 6:15a, mine was the only vehicle in the large lot. There would be a dozen vehicles upon my return but I never saw another soul during the hike. The sun came over the low brown hills to the east soon after I started, but I would spend the first hour nicely shaded on the west side of the crest as the trail slowly makes its way up towards it, weaving in and out of a number of side canyons along the way. Cows were grazing in the main creek drainage, deer and wild turkeys found higher in the open meadows and under forest cover, respectively. I missed a trail junction at the 1.5mi mark where some cattle were lying in the road, blocking both the trail markers and the road. I turned up a spur road where I thought the trail went, eventually finding my way to the crest and open sunshine. Just before reaching it, I found a large black bull standing in the middle of the road. He had a large nut sack hanging from the back end but no horns, still, with this behemoth weighing more than a ton I wanted to give it some distance. I tried to shoo it away but made not a twitch while keeping a fixed eye on me. I don't think I ever saw it blink. So I took to talking calmly to it as I passed to the left within about 3ft - "Ok buddy, I'd have preferred you just wandered off, but have it your way. I'm going to pick up this large dirt clod here in case I have to smash it in your face as I walk by here. You probably don't want that, so just stay cool and we'll leave each other be, okay?" I dropped the clod after passing it and continued up the road. I followed north along the crest for several miles, crossing a number of locked gates, often with nothing but a deer trail along the ridgeline, wondering all the while just how the trail managed to get lost and where it went off to. About half a mile southwest of Ramage Peak I finally found myself crossing the trail once again. I wasn't headed to Ramage Peak today (I had visited that one 4yrs ago via a different route) so I crossed over the trail and headed west up the fire road that rises up and over Riley Ridge, the bonus peak on my way to Peak 980ft. Riley Ridge has less than 100ft of prominence but better views than Peak 980ft thanks to the extra 300ft of elevation. From its summit I could see the reservoir and second peak to the west, only a mile as the crow flies but more like 1.6mi on the roads I would travel. 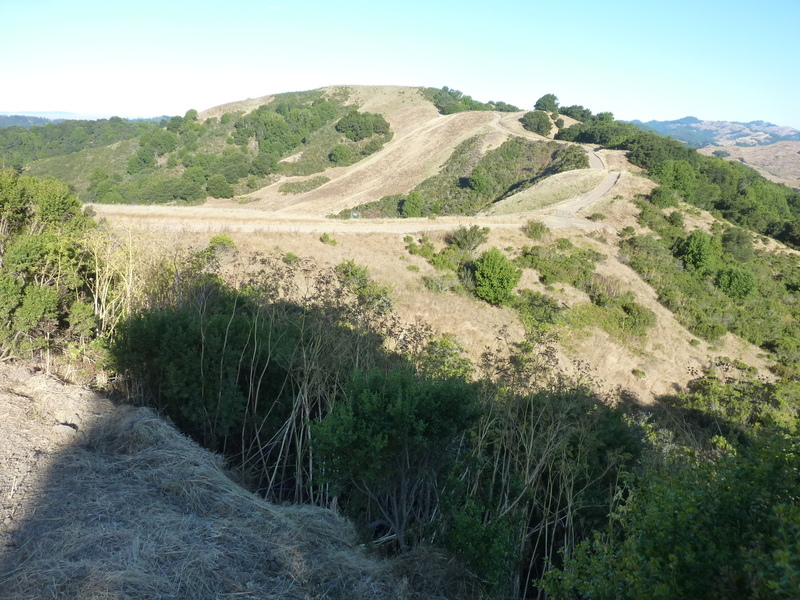 The Ramage Peak Trail is the only route officially open to the public in this part of the EBMUD property. The rest of the area is protected as "wildlife sanctuary" and "protected watershed" but in practice it all seems to be open for cattle grazing. The roads are undoubtedly used by the ranchers to keep track of the cattle and EBMUD personnel to access the reservoir shoreline. For the most part the roads I traveled had very little vehicle traffic which left me unworried, but the 1/3mi on Kaiser Creek Rd after descending Riley Ridge showed regular travel and gave me some concern. I was happy to get off it and onto the little-used road going up and over Peak 980ft. There are two summits of nearly equal height to Peak 980ft (which I doubt is actually 980ft - I think there is an erroneous extra contour shown on the map), so I visited both. I found the southeast summit to be about 5ft higher than the northwest one and it also has better views (the NW summit is buried in oak trees). One can look over the reservoir below to the south and west. I love this area and have done several hikes here. The 'majestic eucalyptus forest' you mentioned is part of a 'Utah-shaped' polygon when seen from the satellite views which I'm sure you've noticed. Very curious. I had seen that when I was reviewing the satellite views, but didn't realize I had stumbled upon it nor that it was formed by the eucalyptus. Curious, indeed.